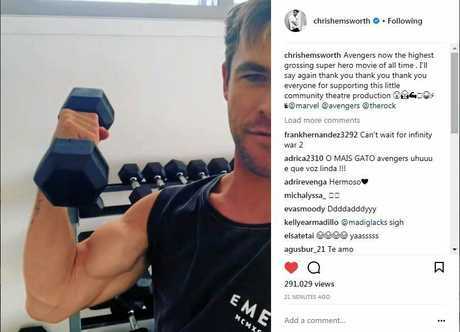 NORTHERN Rivers resident and Hollywood actor Chris Hemsworth thanked fans via social media for the success of the latest Marvel film Avengers : Infinity War. The actor posted a video on his Instagram account, which quickly went viral gaining 291,000 views and more than 2000 comments in the first 30 minutes. The actor recorded the video while working out at a gym. "Just taking a leaf out of The Rock's book, every time he does a post his in the gym so I'm just gonna do a couple of curls while we are chatting," he said, while flexing his right arm for the camera. 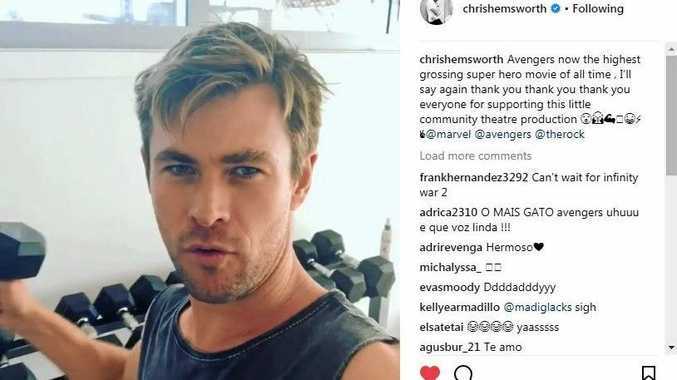 Hemsworth said Avengers : Infinity War opened in Chine over the weekend and it was the second biggest movie opening of all time in that country. "It was the biggest superhero film opening ever, the film continues to smash records left right and centre. "I've said it before and I'll say it again: it's all thanks to you guys, all you legends who went out and saw the film, thanks you so much. "Everyone who continues to support these characters and the Marvel Universe, you are the best." The video was posted while new broke that Hemsworth will serve as the honorary starter of the 102nd running of the Indy 500, which will take place on Sunday, May 27, in Indianapolis, USA.